Hy-Vee, Fareway and Aldi ads. Choose from 2, 4, 6 or 8 servings. 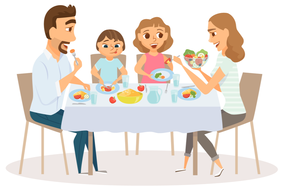 Cut out the conversation starters and use them to spark unique conversation at meal times. Kids love these! Cross off any ingredients you already have on hand from the categorized grocery list. If there are any meals you don't wish to make, use the letter guide to remove ingredients from those meals. If desired, complete the easy and optional weekend prep list. 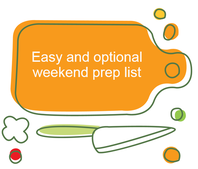 Completing the prep list will save even more time during the week and help you have your meals ready in about 30 minutes or less. Use the Mise en Place list to easily gather all the ingredients and equipment needed for each recipe. Our Mise en Place lists are categorized, making it quick and easy. By gathering your ingredients and equipment before you start cooking, you'll find cooking to be more efficient and stress-free. Cook using our easy-to-follow recipes that are family-friendly. Our recipes are written so that everything is ready at the right time. Enjoy a balanced meal together as a family!